The Queen visited the site of the 500-acre Olympic Park, the centrepiece of London's 2012 Games, saying it was "exciting" and "fascinating". A variety of sporting facilities, including an 80,000-seat stadium, will be built in Stratford, east London. The Queen was taken to the 21st floor of the Holden Point residential tower to see the site. The stadium will host the opening and closing ceremonies, as well as the athletics events. Inflated colour airships were used for the Royal visit to identify the locations and construction work already under way for several of the sports venues planned for the park. 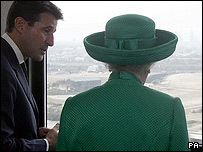 Lord Coe, who led London's successful bid and accompanied the Queen on her tour, said: "I was explaining the project and she said it was exciting. "I told her that this is where we took the International Olympic Committee (IOC) members who were impressed by what they saw. "She said she could understand that and said it was fascinating." The Queen also met workers at the nearby construction site for the Channel Tunnel Rail Link (CTRL) at Stratford which will have a seven-minute shuttle service to central London. Her visit also included sports demonstrations by students from the local Langdon Secondary School, several of whom were in the delegation to Singapore where the International Olympic Committee selected London in July. Work has started on the aquatics centre, which will include two 50m swimming pools and a diving pool. There will also be a hockey centre, four multi-sport arenas for fencing, volleyball, basketball and handball, and a velopark for cycling events. The park will house the Olympic Village, where every competitor and official can stay.